Neal Flum is currently the Assistant Director of Athletic Bands and Director of Pep Bands for the University of Alabama. 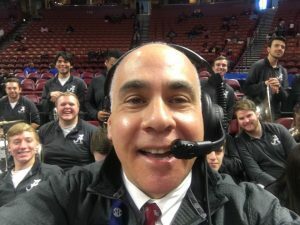 He is also the percussion instructor and arranger for the marching band percussion and is a percussion consultant for The Boston Crusaders Drum and Bugle corps. He was a percussion consultant for The Cadets Drum and Bugle Corps (2010, 2011 – 2013, 2015, 2016). He is a past secretary for the Alabama Chapter of the Percussive Arts Society and served as its President from 1994 until 1996. He was re-elected president in 2004. He is a clinician/endorser for the Pearl Corporation, Vic Firth, Inc., Remo Drumheads, The Avedis Zildjian Co., and Grover Pro Percussion. He is also a member of the staff of Thom Hannum’s Mobile Percussion Seminar. Mr. Flum was the creator and director of the Athens Percussion Festival (1989-2000) and is the co-founder of the Alabama Chapter of PAS Day of Percussion (in its current form since 1994). In the summer of 2006, he was appointed to the Percussive Arts Society Marching Percussion Committee where he now serves as outgoing Chair (appointed in 2008, last year 2015). Neal is listed in the Virtual Drumline Who’s Who of Tapspace Publications. In April of 2008 Neal was selected for induction into his high school’s alumni Hall of Fame, Brentwood High School in Brentwood, New York. Mr. Flum has adjudicated, presented clinics, and consulted in the southeast and has also adjudicated for the Northwest Marching Band Circuit. He was Percussion Caption Head for Music City Drum Corps, located in Franklin, Tennessee (2012 – 2014). He has been published by Warner Brothers’ marching band division, Percussive Notes, and the Pearl Corporation Percussion Resource Library: www.pearldrum.com He contributed an essay to The Drum And Percussion Cookbook: Creative Recipes for Players and Teachers. He is a member of the Music Educators National Conference, CBDNA, and the Percussive Arts Society. In 1992 he was on the percussion staff of the Boston Crusaders Drum and Bugle Corps. He played snare drum in the Spirit of Atlanta Drum and Bugle Corps in 1982. In 1983 he played multi-tenors with the Blue Devils Drum and Bugle Corps (High Percussion Award recipients). Mr. Flum is a graduate of the University of Alabama (BA 1985 and MA 1988), was a member of the Million Dollar Band from 1980 until 1984 (excluding 1983), and served as percussion section co-instructor his final year.